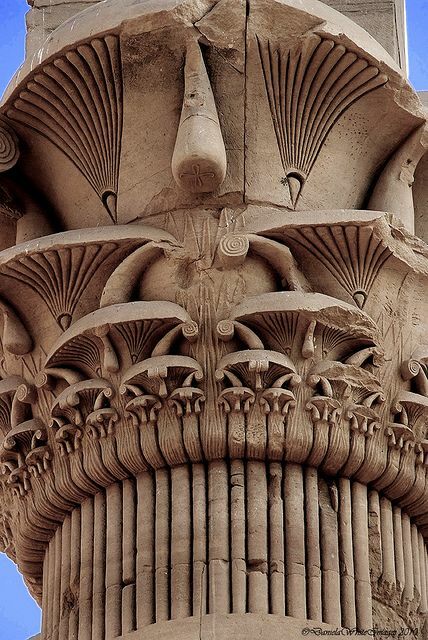 This is a Muqarnas ‘papyrus’ column head. It was an experiment to try to find a way to create columns with muqarnas. It wasn’t successful. But more importantly it has a very pleasing shape. For example, it is reminiscent of some refined column heads. It is similar to the Egyptian papyrus column heads. Perhaps it is more similar to Greek corinthian column heads. This is a successful muqarnas column design which I developed later. However, I find it too simple and not elegant. Additionally, I was unable to fit the muqarnas ‘papyrus’ column head on top of this modest column design. Perhaps someday I will find a more pleasing design. Of course, it isn’t enough to find a solution to a problem. It must also be both aesthetically pleasing and challenging. Click to enlarge. Such a form could also be used as sculpture to decorate a wooded park, as in this whimsical rendering.